On Monday, fans tuned into one of the quieter NHL trade deadlines in recent memory. Despite the slow pace of movements, Matt Cane (@cane_matt) and I set about making visuals to give our takes on each trade. Here, we’ll look back on a few of our takes from the trade deadline. We’ll focus ourselves with three categories – a trade where we had a similar take, a trade we disagreed on, and our favourite viz from the day. *Please note – a number of others contributed viz takes during the day. Check out the #NHLTrade16 hashtag. Fellow Hockey Graphs contributor Dom Luszczyszyn (@omgitsdomi) offered some great work, along with Domenic Galamini (@mimicohero) and the always-great Micah Blake McCurdy (@ineffectivemath). In Ottawa, Shane Prince’s lineup spot had become the focus of much debate. Analytics-minded observers noted Prince’s strong possession rate, well-developed ability to make productive passes, and the potential for growth with additional ice time. But head coach Dave Cameron preferred to keep Prince buried in the lineup, skating on the fourth line with defense/grit-oriented linemates. Rumours of a rift between Prince and management dogged the young forward, which may have contributed to his lack of opportunity in Ottawa. Content to part ways with their homegrown talent, the Senators panicked in the waning minutes of the deadline and managed a measly return – a 3rd round pick. To make matters worse, the Sens agreed to send a seventh round pick along with Prince to the Isles. Ottawa didn’t increase its number of draft choices and included a promising young forward – all for the privilege of moving up four rounds from the back of the draft. The thing that’s so confusing about this deal is how unnecessary it was. 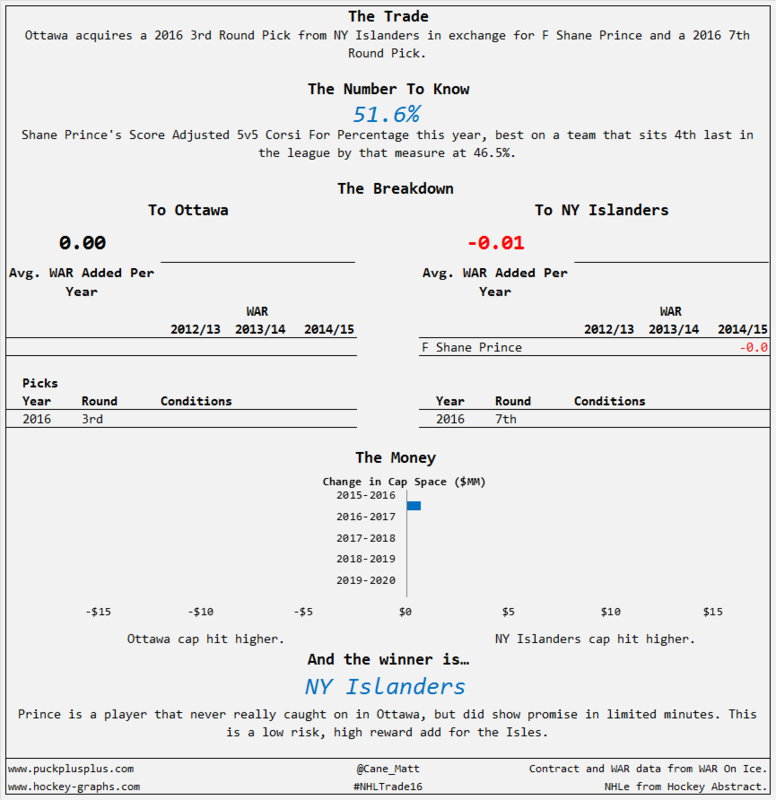 While Prince was going to be a restricted free agent at the end of the season it seemed unlikely that the Sens would be priced out given his limited playing time, and the risk of an offer sheet was next to nill for a player who had only appeared in 42 games for Ottawa at the three-quarter mark of the season. There was no need to rush a move at the trade deadline, as the Sens could have used their final 19 games to pump up Prince’s value, or at worst waited until the draft or the start of next season to trade his rights or execute a sign-and-trade. There were many options open to Bryan Murray and his braintrust, but they seem to have taken the panic route, preferring a certain gain sooner over a potentially larger benefit in the future. Although the former ’67 is still far from being a sure thing, the meager return makes the loss of Prince sting even more for the Ottawa faithful. The Sens held all the leverage in this situation and yet all they managed to end up with was a 3rd round pick for a player who had at least appeared competent in his limited opportunities at the NHL level. Add in the fact that Bryan Murray had to add a 7th round pick (which has roughly 7/10 the value of the third they picked up) to make the deal happen and you can see why most of Twitter was up in arms after the trade was announced (unless, of course, you’re an Islanders fan in which case you were likely celebrating). Some trades can be justified as being reasonable based on differences of opinion, but it’s hard to see how you could argue that Ottawa came close to getting fair value for one of the few prospects with potential left in their system. Disagree – Did the Ducks Miss on McGinn? There’s nothing inherently wrong with the addition of Jamie McGinn, but there’s not a lot of upside to it either. McGinn is a reasonably good scorer who may play an important role for Bob Murray’s club down the stretch, but he’s also not someone who is going to tip the scales and turn you into a cup favourite overnight. They didn’t give up much to get him, but it’s hard to see what problem he fixes that required an immediate move. Part of the problem is that the Ducks probably didn’t need to add a scorer – while their total Goals For sits in the bottom third of the league, a good portion of that can be explained by an all-situations shooting percentage that’s almost 2 points below where they have historically been over the past 8 seasons. As that recovers to their “normal” rate, the goals should come naturally, with or without McGinn. It’s not a bad deal for Anaheim by any means, it’s just a slightly better move for the Sabres, who are able to turn another free agent into an additional draft pick. 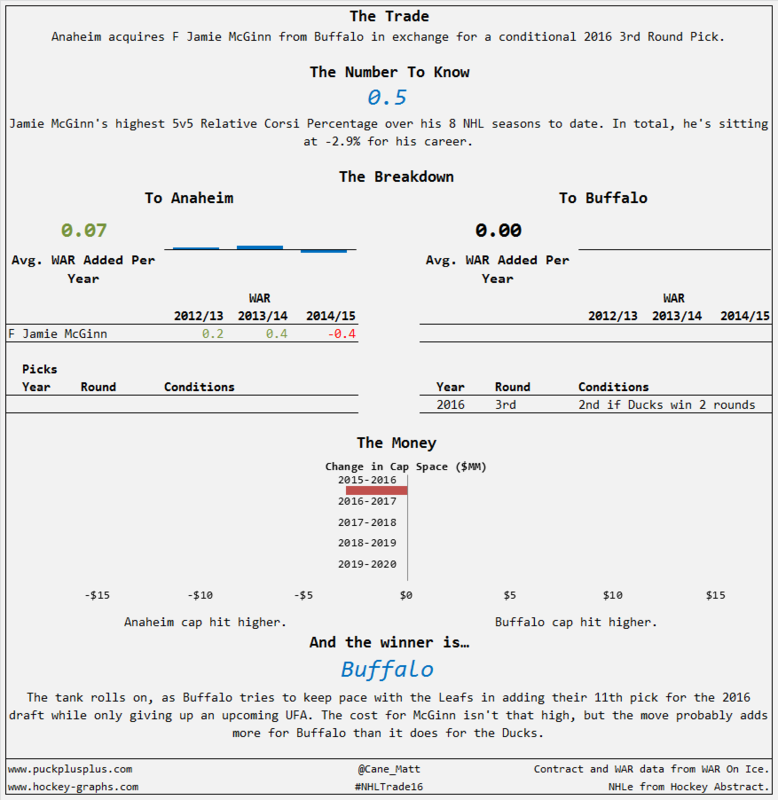 While there’s no Connor McDavid or Jack Eichel to fight for this year, Buffalo still stands a reasonably good chance of picking in the top 3 and landing one of Matthews, Puljujarvi, or Laine. The third round pick they received is a nice return, but ultimately it may turn out to be less of a factor than the replacement level player who is certain to take McGinn’s place for the Sabres’ stretch run. McGinn’s always been a somewhat underrated goal-scorer. His goal per 60 rate is very reasonable again this season, he doesn’t cost much for the balance of this season and won’t command big free agent dollars as a mid/late-twenties depth forward. If McGinn fits in with the Ducks, he’s able to provide very cost-effective scoring and will be available for re-signing in the summer. However, if McGinn doesn’t fit in well, his expiring contract comes off Anaheim’s cap in a couple of months. Sure, he’s never demonstrated strong puck possession skills. But it’s been five years since he was part of a team not named the Avalanche or Sabres. He has the potential to be a fit in the Ducks’ top-nine. For some context on the third round pick, Michael Schuckers’ draft pick value grid (embedded in the viz) shows relatively little value difference between an average third rounder and an average fourth round draft choice. The pick is conditional – it becomes a second round choice in 2017 if the Ducks reach the Western Conference Final – but this is a trade-off that GM Bob Murray would likely be happy to accept. Little cost for a depth scorer with little commitment – this was a very reasonable deadline rental play by the Anaheim Ducks. My favourite trade (and favourite trade chart) of the day was the Kris Russell trade from the Flames to the Stars. Since last year’s luck-fueled playoff run, the Flames have become the poster child for “who needs advanced stats?” Led by truculent president Brian Burke, the team does not have a reputation as analytics-heavy organization. Yet, the Flames managed a very smart deadline move. Russell’s status as a “warrior” is often derived from his uncommonly high blocked shots rate. One look at his CF% shows why he’s frequently in situations that require him to block shots from the other team. He’s aging, about to require a bigger money contract, and doesn’t offer real offense or puck management. Oddly, noted smart GM Jim Nill parted with a great package to acquire the “gritty” Russell. Jyrki Jokipakka may already be a better defenseman – he’s posted superior rates in most advanced stats categories, is younger and is also cheaper. The Flames also added a conditional second round pick, which may become a first rounder if the Stars reach the Western Conference Final. If this wasn’t enough, the Flames also nabbed Brett Pollock – a mid-range forward prospect playing in the WHL. In the end, the Flames were wise simply to be uninterested in re-signing Russell. By acquiring a good, young defenseman, a prospect, and a valuable draft pick, Flames GM Brad Treliving performed admirably. 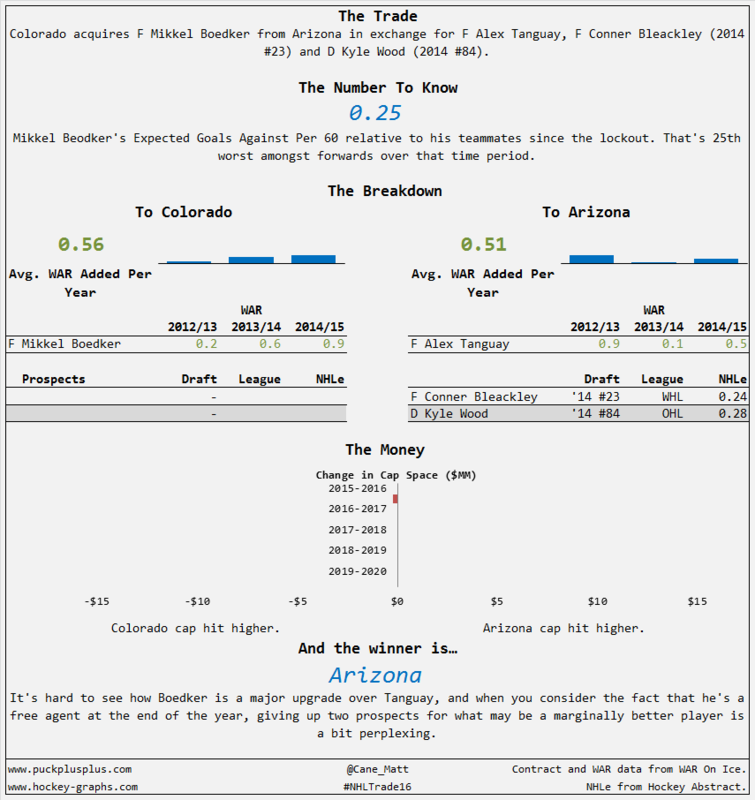 Yes, Mikkel Boedker is younger, but ignoring than that, is there any way in which he’s an improvement over Alex Tanguay? Over the 8 years of his career, the Danish winger has never managed to outpace Tanguay in 5v5 Points per 60, with Boedker also only posting higher all-situation point totals once over that period. While the deal does allow the Avs first crack at bringing back a younger player, youth was never something Colorado lacked, and Boedker’s return is far from guaranteed. What makes this a true loss for the Avs though is that they gave up two decent prospects in the process. Both Conner Bleackley and Kyle Wood are only 2 years out of their draft class and both have maintained a decent scoring pace since they were selected. Wood actually has a higher NHLe currently in spite of the fact that he’s a pointman, and sits 17th amongst OHL defencemen in scoring this year after finishing last year in the exact same spot. While that doesn’t exactly mean he’s likely to be the next Erik Karlsson at this point, it does bode well for his odds of becoming a regular NHL defenceman one day. The best case scenario for Colorado is that Boedker drastically outperforms Tanguay over the last quarter of the year, and they manage to sneak into the eighth spot (where they’re promptly eliminated by Chicago), but if Boedker isn’t the piece to push them over the top, this could end up stinging down the road if Bleackley or Wood pan out. *To check out all of Matt’s work from the day, have a look at puckpuckplus.com. For more of Sean’s work, sift through his vizzes here.